The road from Franz Josef to Wanaka covers the most diverse set of landscapes you will see in New Zealand, and perhaps in the whole world. That is a bold claim, but wait for it! From snowcapped peaks and ancient glaciers on Mount Cook to sandy beaches, incredibly blue rivers, towering waterfalls, and mega-lakes. This road pretty much has all the stops you need to see the world in a day. Then there is the road itself, a winding mountain pass with panoramic views, turn scenic ocean drive. What more could you want? Google “Franz Josef to Wanaka” and you will see this 285 kilometer drive takes approximately three and a half hours. I can assure you Google is wrong this time. They say drive slow, New Zealand roads are different. Here on the road from Franz Josef to Wanaka they couldn’t have been more accurate. 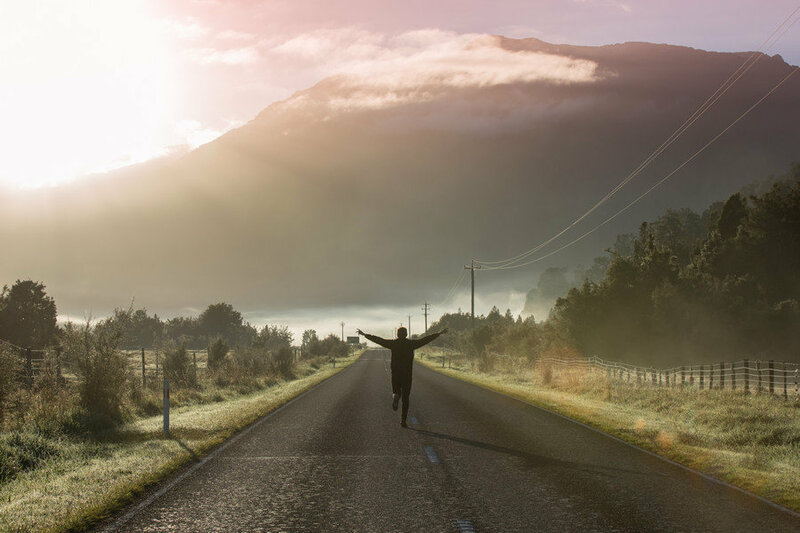 Follow this plan and the road from Franz Josef to Wanaka, and instead of three hours you will have a twelve hour day on the road So wake up early, and be prepared to go to bed late. This is one epic road trip we are about to embark on. Franz Josef is a medium sized town located on the west coast of New Zealand’s South Island. It is most popular for the Franz Josef Glacier and numerous other hiking trails. I suggest doing the 5.4km Franz Josef Glacier walk the day before you continue on to Wanaka, otherwise, you will not complete everything in time. If you walk quickly you can fit a few hiking trails in the one day. Another popular short walk is the Blue Pools which with an amazing view of the Franz Josef Glacier reflected in the lake. When you are finished hiking and legs are worn out, head over to the Franz Josef Glacier pools. There’s no better way to relax than to soak away in a hot pool. You can opt for either a two hour entry, or a multiple entry day-pass. Further down the coast is the Fox Glacier Valley Track. This is a 2.6 kilometer round-trip hiking trail. The walk, which takes about one hour total, will lead you to the base of Fox Glacier. During our visit to the West Coast, the road was closed due to weather. However, you can check New Zealand’s Department of Conservation website for more details. Save your breakfast and head down to the Salmon Café, located 85 km south of Franz Josef. 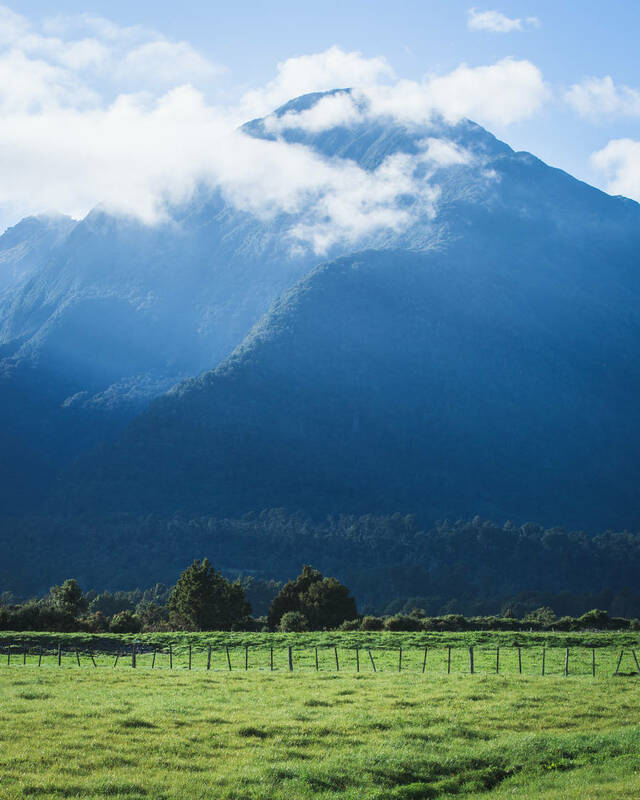 This is where you will find the freshest salmon in New Zealand. The Salmon Café actually farms the salmon on site, in three large nets down below the cafe. Grab a bucket of fish food for a dollar, and throw it into the nets to see just how many salmon live here. If you love your fish, then try out a salmon steak, salmon bagel or just a serving of smoked salmon on toast for breakfast. You can also buy a chunk of smoked salmon for your lunch on the road. The smokey flavor in this fish is intense! The Knights Point Lookout is just a quick stop on the side of the road. 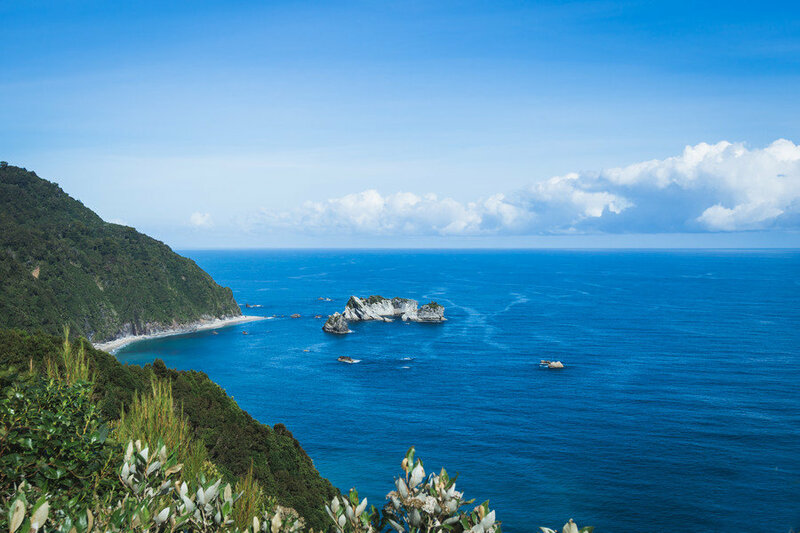 The lookout has great views of the rough Tasman Sea along New Zealand’s South-West Coast. The interesting rock formations here resemble Australia’s Great Ocean Road, albeit smaller and further away. The Roaring Bills Falls are the first in a series of three waterfalls on the road from Franz Josef to Wanaka. This section of the road is similar to the Atherton Tablelands waterfall route in Queensland, Australia where you can visit a series of waterfalls in a short distance. 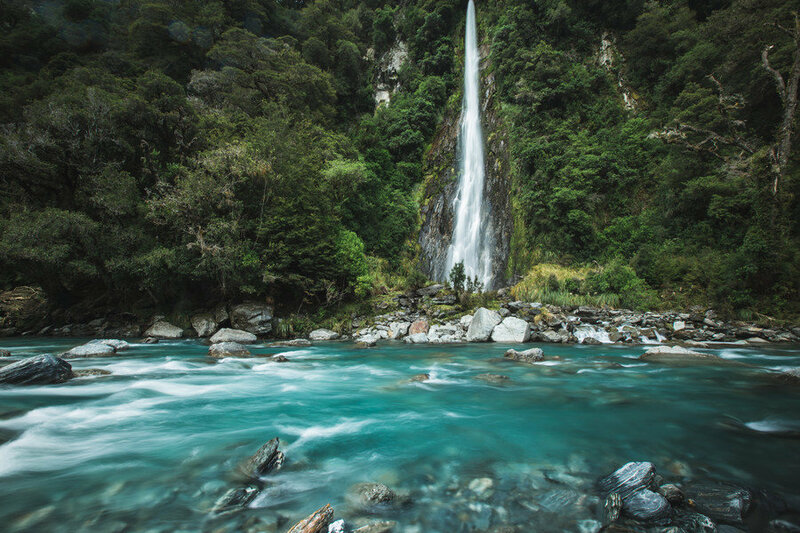 The waterfall is a 30 meter tall cascade in the Mount Aspiring National Park. The water runs down into the Haast River and is accessed by a 40-minute hike from the carpark. The Thunder Creek Falls are located a 5 minute walk from the main road. The short, easy walking, forest trail takes you out to a viewing platform at the river’s edge where you can see this 96-meter tall waterfall without getting wet. It is possible to get closer to the waterfall and even shower under it. To do this, you will need to cross the river. This is the tricky part as the river is deep in parts and has a strong current. The glacial water is also freezing cold! The Fantail Falls are the third waterfall stop on the road from Franz Josef to Wanaka. Due to time, we did not visit this waterfall. As there are so many places to visit along the way, I suggest stopping at two of the three waterfalls listed in this guide. The Fantail Falls are located a short 5 minute walk from the main road. Check here for further information on visiting the waterfall. Stop by Cameron’s Flat picnic area for lunch with a great view. A small camp kitchen sits on top of the mountain looking back over the valley with the huge Mount Cook in the background. With toilets and running water available at Cameron’s Flat, it is an ideal place to spend the night if you are running short on time. Camping fees are standard as per all national parks in New Zealand, just drop the NZD 12 per person in the box and grab a tag for your campervan. The road sign for Blue Pools does not suggest much about this secret little spot. However, as you reach the carpark and see both sides of the road lined with campervans, you know there is something good down the hill. A 15-minute walking trail takes you through an old pine forest, across rope swing bridges and down to the clearest glacial waters you will ever see. And yes, you can swim here, so bring your towel! Alongside the Nanda Blue Lagoon in Santo, Vanuatu, this is the bluest water I have ever seen occurring naturally in the world. Jump in for a quick swim in the freezing cold water. 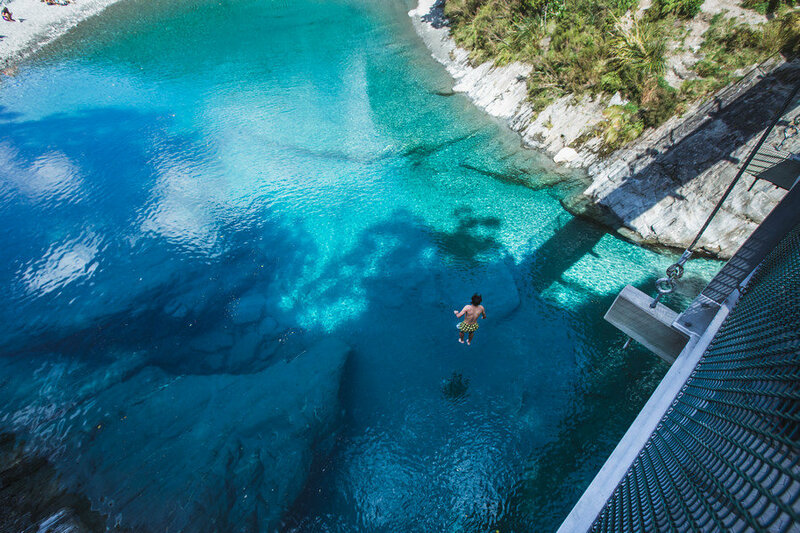 If you are brave enough, you can even make the 15-meter jump from the rope bridge into the deep water below. There are additional hiking trails that continue further into the forest from the Blue Pools. If you want to spend longer here to explore the trails, then spend the night at Cameron’s Flat Campsite just 1km back up the road. Continuing on to Wanaka, the landscape changes quite dramatically from forested mountains to huge blue lakes. When I say huge lakes, I mean they really seem to go forever. 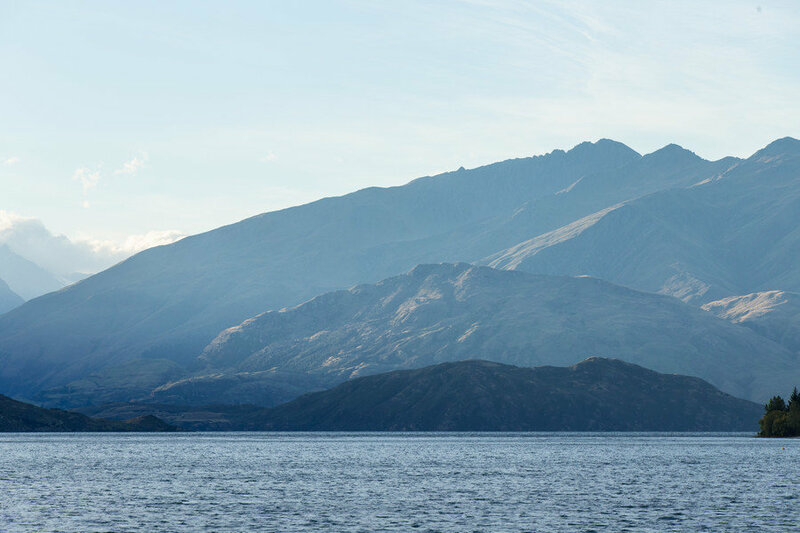 Both Lake Wanaka and Lake Hawea are amongst the top 10 largest lakes in New Zealand. To give you an idea of the size, Lake Wanaka is over 40 kilometers long in the north to south direction and covers over 192 square kilometers. It is estimated that the deepest point is over 380 meters deep. That is a lot of water! The road remains scenic with plenty of amazing lookout points where you can admire just how huge these lakes are. There is one point in particular call The Neck where the two massive lakes are separated by less than 2 kilometers. Warning: while the view is amazing, the wind can be strong. I advise against flying a drone here in high wind, I almost lost my brand new DJI Mavic Air! Wanaka is the end of this huge 285 kilometer drive, and what a spectacular place to stop. Located at the southern end of Lake Wanaka, this little town has a lively vibe with cafes, pubs, bars, and restaurants open from early until late. Celebrate the end of your drive with a locally brewed craft beer on the terrace of Kai Whakapai. You’ll get a good view of Lake Wanaka at sunset. You’ve earned it. There are plenty of hiking trails to explore around Wanaka over the next few days. The most Instagram famous hike is Roy’s Peak, however, Rob Roy’s Glacier is arguably more scenic and much less talked about. For budget campervan accommodation in Wanaka check out the Wanaka Lakeview Holiday Park. Despite the name, it is actually set a few streets back from the lakeside. Keen to stay a bit further out of town? Continue another 30 minutes around Lake Wanaka to the Glendhu Bay Motor Park. You can get a great unpowered lakeside spot here, though there are no shops around. What was your highlight of the road from Franz Josef to Wanaka? 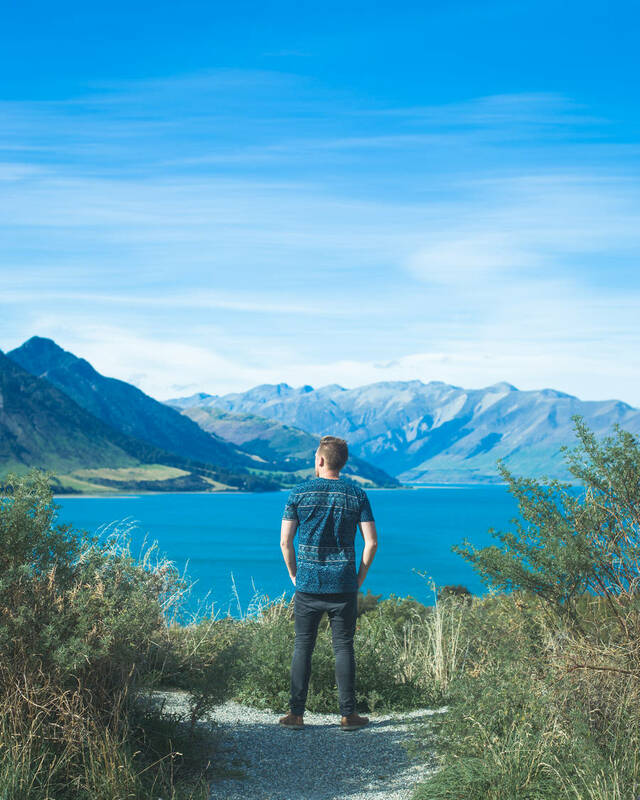 Where to next in New Zealand?